Awards program to recognize and honor a diverse array of females in the restaurant technology industry. 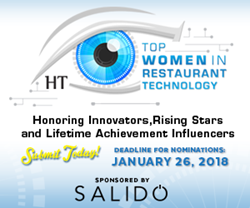 Hospitality Technology (HT) magazine is pleased to announce that it is accepting nominations for the second annual Top Women in Restaurant Technology Awards. The program, sponsored by SALIDO, will recognize and honor a diverse array of females in the restaurant technology industry, including restaurant companies and technology providers. Honors will go to those accomplished women who are reimagining how things are done in restaurants while demonstrating excellence in leadership, inventiveness and skill. “At SALIDO our workplace diversity fosters a thriving, creative, and capable culture that directly enables our company’s success, which is why we’re honored to support the Top Women in Restaurant Technology Awards," said Shu Chowdhury, CEO/Founder of SALIDO, the restaurant operating system. “We are thrilled to have the privilege to shine a spotlight on those industry leaders we admire across long time veterans and future leaders. We look forward to honoring these remarkable women whose achievements continue to improve and evolve our industry by seamlessly blending together their passion and commitment to hospitality technology." Presented to women from any level of an organization, with less than five years of experience in the industry, who have demonstrated leadership and are already making a mark in restaurant technology at an early stage in their careers. From an up-and-coming social media guru at a restaurant brand to a stellar sales rep for IT providers, we want to recognize rising star rockstars! Presented to women who are forward thinkers and who have executed on tools and strategies to transform the restaurant technology space in a positive manner by creating or deploying emerging technologies that reimagine how things are done while paving the way for future technologies. The Lifetime Achievement Award: This award is presented in recognition of a lifetime (no less than 15 years) of service and accomplishments in the restaurant technology industry. We seek to honor women who have had an impact on the restaurant technology industry as well as their colleagues and industry peers through enthusiasm, mentorship and commitment, while also showing how technologies can provide new ways of doing things. Winners will be chosen by Hospitality Technology magazine and members of its Research Advisory Board. Winners will be profiled in the April 2018 issue of Hospitality Technology. An awards program will also honor the winners at the 23nd annual MURTEC (Multi-Unit Restaurant Technology Conference), being held April 11-13, 2018 at The Paris in Las Vegas. Nominations can be submitted at: https://www.surveymonkey.com/r/TopWomenInRestTech. The deadline for nominations is January 26, 2018. Hospitality Technology (HT) is the only publication dedicated to covering the role of information technology in improving business performance for hotel and restaurant operators. The Hospitality Technology editorial portfolio includes: a print publication that publishes nine times annually and reaches more than 16,000 hospitality industry executives, three networking and educational events (MURTEC, HT-NEXT and MURTEC Executive Summit), a comprehensive website, e-newsletters, web seminars, and several exclusive annual reports and studies. Visit Hospitality Technology online at http://www.hospitalitytech.com. Hospitality Technology is published by Chicago-based EnsembleIQ. EnsembleIQ is a premier business intelligence resource that exists to help people and their organizations succeed. It is structured to serve the business-to-business needs of retailers, consumer goods manufacturers, technology vendors, marketing agencies and retail service providers by using its integrated network of media and information resources designed to inform, connect and provide actionable marketplace intelligence. Learn more about EnsembleIQ at http://www.ensembleiq.com. EnsembleIQ is a portfolio company of RFE Investment Partners, a private equity investor with more than 30 years of experience investing in growth companies in partnership with strong management teams. Information on RFE can be found at http://rfeip.com/.